Connoisseurs who like their martinis very dry suggest simply allowing a ray of sunlight to shine through a bottle of Noilly Prat before it hits the bottle of gin. 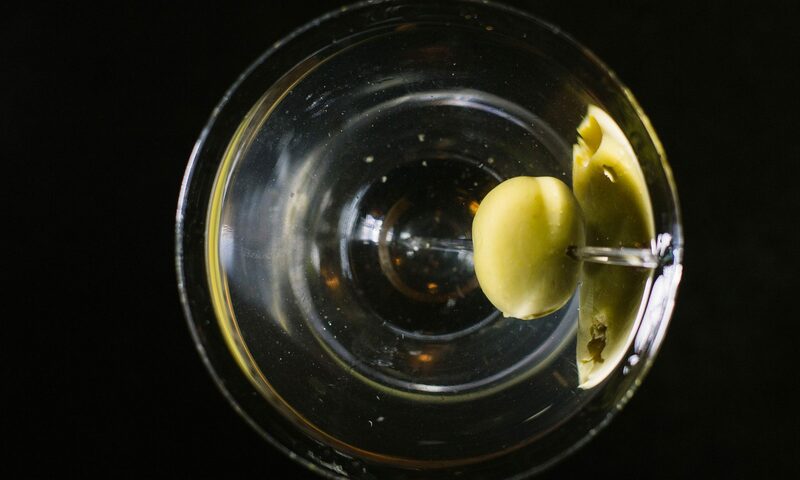 At a certain period in America it was said that the making of a dry martini should resemble the Immaculate Conception, for, as Saint Thomas Aquinas once noted, the generative power of the Holy Ghost pierced the Virgin’s hymen “like a ray of sunlight through a window – leaving it unbroken”. The day before your guests arrive, put all the ingredients – glasses, gin, and shaker – in the refrigerator. Use a thermometer to make sure the ice is about twenty degrees below zero (centigrade). Don’t take anything out until your friends arrive; then pour a few drops of Noilly Prat and half a demitasse spoon of Angostura bitters over the ice. Stir it, then pour it out, keeping only the ice, which retains a faint taste of both. Then pour straight gin over the ice, stir it again, and serve.James Bond. Shaken, not stirred. Need we say more, doll? Franklin Delano Roosevelt. Our 32nd President loved martinis so much that he traveled with his own martini kit. His recipe was on the dirty side – two parts gin, one part vermouth, olive brine, a lemon twist and an olive. Clark Gable. James Gannon, the newspaperman Clark Gable played in Teacher’s Pet, would hold a bottle of vermouth upside down to moisten the cork and then run the damp cork around the lip of the martini glass. Alfred Hitchcock. The famed Hollywood film director and producer liked his martinis very dry, with just “one short glance at a bottle of vermouth”. Sir Winston Churchill. The former Prime Minister of the United Kingdom, Churchill favored a very dry martini. As Churchill famously said, the only way to make a martini was with ice-cold gin and a bow in the direction of France.